Periodically throughout the rest of the season, we will use this column to take a look at who’s making history and who’s saying what around the SEC. Here’s Volume I of what’s Quotable and Notable right now in college basketball’s Southern reaches. “I just went strong to the hole.” Florida’s Dorian Finney-Smith on his game-winning dunk against Alabama. No player in the country will have a minute as impressive and unlikely as Finney-Smith did in the final 60 seconds of Florida’s recent win against the Crimson Tide. His fierce drive and dunk ended up being the game-winner, and it was sandwiched around two crucial blocks: a body-straight-up rejection on Michael Kessens to keep the game knotted at 50, and a help defense block of Levi Randolph’s potential game-tying shot as time expired. This all coming after the junior had gone scoreless to that point. Finney-Smith’s magical minute, which helped end Florida’s three-game losing streak, should be one of the highlights of Gators’ season. “Georgia is probably the second best team in the league and, by far, the most physical team.” Mississippi State head coach Rick Ray after his team’s loss to Georgia last weekend. “I thought they hurt us on the boards in the first half, but then you look down and see they hit 50 percent from the field in the second half and over 90 percent from the line… you can’t beat anybody like that.” Vanderbilt head coach Kevin Stallings after Georgia hit 23-of-25 free throws and outrebounded the Commodores by 10 in an eight-point victory. Georgia is taking on the feel of a team that can grind out wins, and in this league, that can be the key to a shiny conference record. Just take care of business. The Bulldogs squeaked by Mississippi State because of a Herculean effort from J.J. Frazier (37 points), and against Vanderbilt, they were sloppy with the ball (16 turnovers) but did enough elsewhere to control the game throughout. Neither win is all that impressive alone, but SEC teams have perfected the art of losing winnable games. The Bulldogs will end up in the NCAA Tournament if they have finally bucked that trend. For the next nine weeks or so, we’ll run down a few weekly superlatives from league play, take a look at how conference teams look in the eyes of the NCAA Tournament selection committee, and anything else that merits discussion. Here is Volume III, including games from January 12-18. Team of the week. It took three rounds of this column to get there, but the league Colossus finally gets the nod. Kentucky did in the second week of SEC play what so many predicted it would do in the first — thrash its opponents. The Wildcats beat Missouri by more points (49) than it allowed the Tigers to score (37), and, as Brian pointed out earlier this week, it was the best defensive (points per possession) performance in conference play in the Calipari era. The ‘Cats followed up that victory with an easy 22-point win against a good Alabama team. Its defense was again outstanding, but it was the Kentucky offense that caught my eye in Tuscaloosa. Just one week after a rough outing in College Station (28.1% FG, 32.1% 3FG, 25-of-35 FTs), the Wildcats were hyper-efficient in a slow-paced game (50% FG, 47% 3FG, 16-of-18 FTs). If that’s a sign of the Wildcats’ offense to come, it’s worth wondering whether this team may actually cut down the nets in early April sporting a goose egg in the loss column. Tyler Ulis led an efficient Kentucky attack against Alabama with 11 points and two assists (AP Photo). Player of the Week. Let’s follow the crowd and hand it to Tennessee’s Armani Moore. The junior wing won the SEC’s Player of the Week award and it was well-deserved. He contributed solid scoring totals in last week’s wins over Arkansas (14) and Missouri (15), but more importantly scored crucial points late in both games. His two free throws sealed the Vols’ victory over Arkansas, and he broke a tie-game in Columbia with under four minutes to go with a contested layup. The 6’5″ Moore also helped an undersized Tennessee front line win the rebounding battle in both games. Texas A&M’s Jalen Jones, who played well in returning from an ankle injury, and Georgia’s Kenny Gaines, who guided the Bulldogs through a crucial undefeated week, also deserve mention. Tournament Chatter. Can you say mediocrity? The league currently has seven teams sitting at 2-2, and the only 3-1 teams (Tennessee and Florida) appear to be well behind several of those in the NCAA Tournament pecking order. None of the fringe NCAA contenders have yet played their way out of the picture but we could be headed toward the league’s nightmare scenario. A team or two separating from the pack would lock in a few bids, but if the soft middle continues to beat up on each other without rhyme or reason, it risks damaging everyone’s profile. Still, 10 (10!) teams are worth mentioning and that’s not too bad. So many potential narratives started swirling around after Kentucky’s shaky outings against Ole Miss and Texas A&M. Had the Wildcats become unfocused and vulnerable? Would they respond? Was the sky falling? At least for now, it seems the close calls indeed got the ‘Cats attention. “I think those struggles just reset our mind,” Willie Cauley-Stein told the Louisville Courier-Journal. “Now we’re back to like, ‘OK, we’re trying to shut people out.’ We’re not just trying to play with them. We’re trying to demoralize them.” After allowing Ole Miss to score more points per possession than it had any team this season (1.09), Kentucky broke Missouri’s soul (0.58) and then stifled a good Alabama squad (0.83). Given Alabama’s length, athleticism and desperation for a marquee win, the game in Tuscaloosa may have been one of the tougher road assignments Kentucky will face this year. They passed it easily, and it seems the appropriate narrative is that the Wildcats’ slow start to conference play may have in fact been a positive thing. Kentucky isn’t the only team that took something away from its SEC opener against Ole Miss. The Rebels weren’t intimidated in Rupp against a seemingly invincible opponent, and they brought that same confidence to Fayetteville when they whacked Arkansas 96-82. If you combine their shooting stats from both games, the Rebels shot 53.1 percent on 32 three-point attempts. That is precisely the way to give yourself a chance against good teams in tough environments. 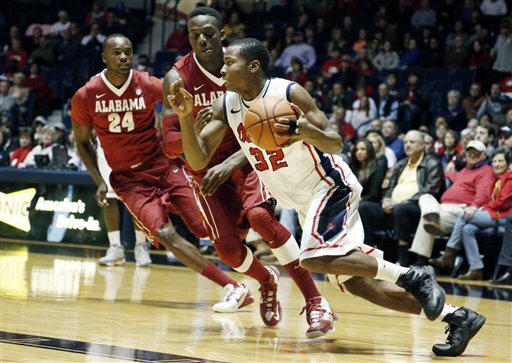 The abundance of bravado has to be tied to Ole Miss’ veteran backcourt of Jarvis Summers, Stefan Moody and Snoop White. The trio has guided the Rebels to a 2-2 record against arguably the best the SEC has to offer: Kentucky, South Carolina, LSU and Arkansas. Ole Miss may be able to make some hay as the schedule eases up, especially if it keeps lighting it up from deep. Is Texas A&M’s Jalen Jones the most important player in the SEC? Probably not, but the Aggies are 2-0 with him in SEC play and 0-2 without him. Billy Kennedy’s leading scorer returned from an ankle injury to score 16 points in a win over Mississippi State and then 18 points in Saturday’s win over LSU. The latter performance was all the more impressive since it came against the Tigers’ ultra-talented front line. Would a healthy Jones have given the Aggies the slight edge they would’ve needed to drop Kentucky? We will never know, but with how Texas A&M has struggled to score this season, it needs Jones to remain healthy if it has any chance of ending up on the tournament bubble. Auburn’s big recruits a year away. The team was coming off a 20 point loss. Kentucky wasn’t in town. And this is Auburn, after all. Nonetheless, Auburn Arena was rocking Saturday night during the Tigers’ quality win over South Carolina. This is the Bruce Pearl effect. We heard about the spike in season ticket sales during the offseason, and actually saw it come to life against the Gamecocks. Cinmeon Bowers – who is becoming a star in the SEC – ripped down an offensive rebound and converted a tough layup to extend the Tigers’ lead to three with under four minutes left and the arena exploded. Last year, a scene like that seemed a world away. But there is truly excitement around Auburn basketball, and with home wins over Missouri and Carolina, not to mention the emergence of Bowers as a double-double machine, there is tangible progress on the court too. Again, this is the Bruce Pearl effect, and the entire league is better for it. Florida’s 24-game conference win streak came to an end with an unusual sight. Michael Frazier and Dorian Finney-Smith were glued to bench for a large swath of the second half in the Gators’ loss to Georgia, and not because of foul trouble. “For me, it was just, let’s play (freshman) Devin Robinson, Chris Chiozza. Let’s get them some experience. Let’s let them play. These older guys aren’t playing at the level we need them to play at,” Billy Donovan told the Gainesville Sun. Despite the loss, Florida’s 3-1 conference record does not have it in a helpless position so the benching was a somewhat bold move from Donovan. It might signal that this season has become as much about building for the future as it is contending in the present. And that’s not a bad thing, because except for senior Jon Horford, this same Florida team will likely take the floor together next year. One of the league’s hottest players since entering SEC play has to be Kentucky’s Devin Booker, who scored 13 points against Ole Miss, 18 points against Texas A&M and seven last night against Missouri. During the three-game run he was 8-of-11 from distance, and it is his outside shooting that makes Booker such a dangerous weapon for the Wildcats — perhaps the best long-range threat since Doron Lamb rained triples for the 2012 championship team. He won’t shoot at such a blistering rate all season long (currently 50.8%), but if he continues to produce it’ll be hard for John Calipari to keep him off the court in close games. Despite their exceptional defensive talent, the Wildcats don’t have all that many players who can create their own shot; therefore, the offensive threat that Booker poses will make it easier for guys like Karl-Anthony Towns and Dakari Johnson to find room inside to operate. It appears Ole Miss did indeed take something away from its near-win at Rupp Arena last Tuesday. “If we can do that against Kentucky, we can do that against anybody else,” forward Sebastian Saiz told the Jackson Clarion-Ledger. The Rebels followed it up with a solid win over the weekend against South Carolina, and have two big opportunities ahead against LSU and Arkansas. If Ole Miss can win both games — no easy task considering that the Razorbacks game is in Fayetteville — the NCAA Tournament bubble could start to come into view. What could set the Rebels apart is that they can actually put the ball in the basket (24th in adjusted offensive efficiency) in a league where many teams struggle to score. 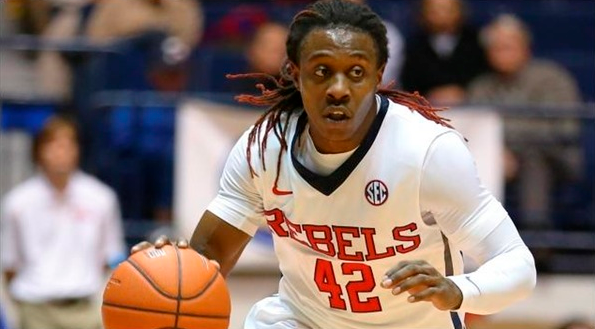 Jarvis Summers and Stefan Moody were both a bit inconsistent to begin the year, but when the two guards are both hitting shots at the same time, the Rebels can be a handful. Florida’s ultimate potential is tied in large part to Kasey Hill’s development. The sophomore has struggled shooting the ball this year, making just 20 percent of his two point jump shots and 25 percent of his three point shots. Billy Donovan thinks that while Hill will likely never be a lights out shooter, there is room for growth. Hill is one of the quicker guards in the SEC, but his inability to keep defenses honest has likely had an effect on Florida’s ability to take advantage of Chris Walker’s athleticism at the rim. Walker has not shown he can create offense on his own and would be benefitted greatly from Hill breaking down the defense and creating seams. But the more defenses can sag off Hill, the less he’ll be able to create opportunities for others. Nonetheless, Hill is an ultra-talented player and a slight improvement would go a long way for Florida. A rash of injuries has followed a tough opening week for Georgia, which could now be down three rotation players. The scariest situation happened to freshman Yante Maten (18.2 MPG), who suffered a concussion after being hit by a car outside of Stegeman Coliseum. Kenny Paul Geno (9.8 MPG) broke his wrist against Arkansas, and an Achilles injury could keep Juwan Parker (23.9 MPG) out of tonight’s game against Vanderbilt. Mark Fox has been essentially using a seven-man rotation with Parker and Maten getting the most minutes of all the reserves. Even if Parker can suit up, the Bulldogs may need Marcus Thornton and Nemanja Djurisic to play close to 40 minutes in a critical game. Fox has to hope Cameron Forte can provide some cover. The junior forward was pressed into 24 minutes of action against LSU after never seeing more than six minutes in a game prior to that, and held up well with 10 points and six rebounds. Another reserve big man that saw his minutes explode in the LSU-Georgia game was Darcy Malone, who played 16 minutes after having only seen 20 minutes total before the game. This was the latest in Johnny Jones’ season-long quest to find depth, especially in the front court. The big man group of Malone, Brian Bridgewater, Elbert Robinson, Aaron Epps and John Odo has combined for just 6.3 rebounds per game. With that kind of production, or lack of production, you can’t blame Jones for rolling the dice. Luckily for the Tigers it appears that freshman guard Jalyn Patterson has emerged as a solid backcourt contributor. In fact, Jones trusts Patterson so much that he had him in over Josh Gray, who was having an erratic game taking care of the ball, late in the Tigers’ loss to Missouri last week. 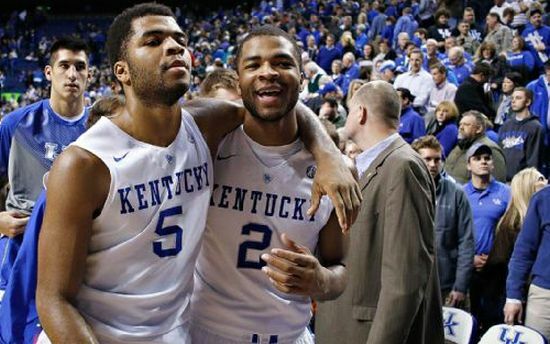 All that undefeated talk surrounding Kentucky was so 2014, right? Or maybe not. The Wildcats stole the college basketball spotlight last night by needing an overtime to defeat pesky Ole Miss, but if Jarvis Summers hadn’t settled for a deep and contested three as time expired, or if Snoop White had been a half-inch behind the three-point line on a second half jumper, Kentucky might well have opened 2015 with a home loss that nobody saw coming. For now, the Wildcats’ survival cools the notion that the team needs only roll out the ball in league play to reach the NCAA Tournament unscathed, but some warning signs became apparent. Here are several thoughts from last night’s wild game in Rupp Arena. Arkansas’ showdown in Hilton Coliseum with Iowa State last night went, well, as you might have expected it to go. The Razorbacks weren’t able to build on their rare-in-the-Mike-Anderson-era road win at SMU and were instead trounced by the Cyclones. This might yet be a team that can consistently play well away from the friendly confines of Bud Walton Arena, but it wasn’t apparent last night. To be fair, the Cyclones were an offensive buzzsaw (64.0% FG, 10-of-19 from three), as it seemed they were either hitting threes or making transition baskets on nearly every possession en route to 95 points. Arkansas ended up shooting a respectable 36.0 percent from three, but what did the Razorbacks in was their inability to put a stop to a first half Iowa State run that pushed the lead out to 20. The silver lining? Bobby Portis looked right at home (19 points on 8-of-10 shooting) against top quality competition. LSU picked up a big win for itself and the SEC by knocking off West Virginia last night in Morgantown. In what was probably the biggest win of Johnny Jones’ tenure, the Tigers notched another nice win for their ultimate NCAA Tournament resume. Whether it’s lucky, encouraging or just strange, the Tigers were able to win without Jordan Mickey scoring until after the last media timeout. Jarell Martin (18 points, 14 rebounds) did a lot of the heavy lifting, but LSU wouldn’t have won without Tim Quarterman (21 points, seven rebounds) and Keith Hornsby (15 points, five rebounds). Quarterman has now scored 14 or more points in the last four games, and the Tigers suddenly look like more than a two-man show in Baton Rouge. Vanderbilt came back from a nine-point halftime deficit to pull within two points against Baylor in the final minutes of its game Thursday night, but the Commodores couldn’t pull out the victory, as Riley Lachance missed a game-tying three at the buzzer. It’s especially disappointing because a win against a team that currently holds the #14 spot in KenPom’s ratings was well within reach. Vanderbilt now gets nine days off before another resume-enhancing game at home against a major conference team, Purdue. The good news is that Damian Jones and Luke Kornet are emerging as one of the more underrated frontcourt duos in the country. Kornet has been great from deep (15-of-26) and is a good complement to Jones’ low-post ability. An opportunity slipped away at Ole Miss last night, as the Rebels turned in an ugly offensive performance in a home loss to TCU. Ole Miss shot just 29.8 percent from the floor and Jarvis Summers had his worst game of the season (2-of-12 shooting, three turnovers). Worth noting is that Andy Kennedy kept Summers on the bench with the Rebels trailing by 12 points in the final two minutes. A comeback at that point was more than improbable, but you never expect a senior like Summers (who didn’t appear to be injured) to be sitting at a time like that. This game might be a reflection of how improved TCU is this season, but you would have expected a better showing from Ole Miss at home after two big wins against Creighton and Cincinnati. The Naismith Award top 50 watch list was released on Wednesday and it features five SEC players: Kentucky’s Karl-Anthony Towns, LSU’s Jordan Mickey, Kentucky’s Aaron Harrison, Florida’s Michael Frazier and Kentucky’s Willie Cauley-Stein. This number of SEC players seems about right, and I can’t think of any glaring omissions off the top of my head. LSU’s Jarell Martin could probably make a case to be on this list, but he didn’t jump off the charts last year so it’s understandable he didn’t make it. It is interesting that Aaron Harrison got the nod while brother Andrew did not, especially because Andrew plays what many consider the more important position. It could be that the difference is the impression still left by Aaron’s late-game heroics in the NCAA Tournament last year. Finally, there is a team in the SEC other than Kentucky that is making some non-conference hay as Ole Miss went to Niceville, Florida and won the inaugural Emerald Coast Classic. The Rebels knocked off a ranked Creighton team on Friday and then Cincinnati on Saturday in the championship game. The wins were absolutely necessary to make amends for an overtime loss at home on opening night to Charleston Southern. Ole Miss was able to win the tournament because it brought an efficient offense down the Florida Panhandle. The Rebels shot 52.1 percent against the Blue Jays (25-of-48) and 49.0 percent against the Bearcats (25-of-51), and only turned the ball over 14 times over the course of both games. The Rebels lost a lot of offensive firepower when Marshall Henderson left, but that kind of execution will be just as hard to stop as Henderson’s scoring bursts were. Yesterday was a busy day in the always-interesting world of SEC basketball. Kentucky and Florida were both idle, but the league still managed to go 5-1 with the only blemish being Texas A&M’s loss in an ugly game against Dayton. That’s a successful day considering Dayton sits respectably at #50 in KenPom’s latest ratings and the SEC has already taken its fair share of lumps this year. Small steps, people. Here are a handful of thoughts from yesterday’s action. 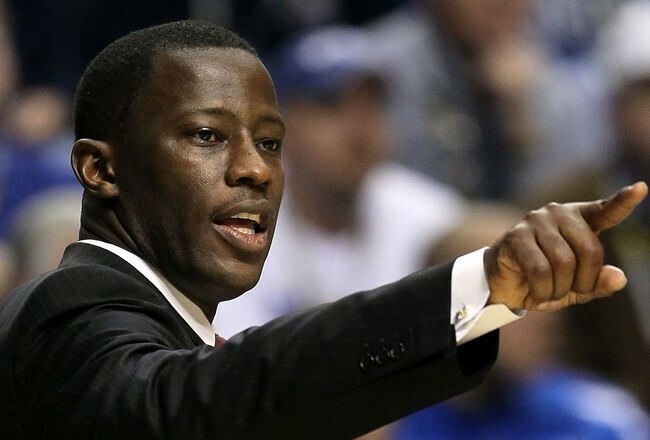 Anthony Grant may have the personnel to run an effective zone this season (Bamahoops.com). Alabama flashes defensive potential against Southern Miss. We can finally mention Southern Miss on this microsite without discussing Donnie Tyndall. The story of this game, won by Alabama 81-67, was the potential of its defense. The Crimson Tide are flush with long, versatile guys this season who can play both on the perimeter and in the post. Anthony Grant ran a lot of 1-3-1 zone against the Golden Eagles, and while it didn’t exactly flummox them as they scored a point per possession, the strategy could turn into a nice season-long weapon for Alabama. Consider the personnel in Grant’s rotation: Levi Randolph (6’5’’), Rodney Cooper (6’6’’), Shannon Hale (6’8’’), Jimme Taylor (6’10’’), Michael Kessens (6’9’’) and Riley Norris (6’7’’). All of these guys are either natural wings or can hold their own on the perimeter. Ricky Tarrant also looked at home in picking up three steals out of the zone. It worked last night largely because the Golden Eagles went 8-of-29 from three, but it’s something for opponents to think about going forward. The SEC microsite will preview each of the league teams over the next week, continuing today with Ole Miss. Andy Kennedy might have his deepest team yet at Ole Miss despite the fact he’s replacing the most prolific player of his tenure. Yes, Marshall Henderson is gone, but Jarvis Summers is not. And if you had to pick between the two, you’d be hard-pressed to pass over Summers since he was quite simply one the best players in the SEC last season (ninth in PER). LaDarius White is another senior starter in the backcourt and Kennedy also adds two guards with Division I experience in Stefan Moody and Terence Smith. The frontcourt has its offensive limitations but could go as far as five deep. The optimistic Ole Miss fan sees players like Aaron Jones and Dwight Coleby filling their roles protecting the rim, while Anthony Perez and Sebastian Saiz develop into consistent contributors on offense. Henderson will of course be missed, but Kennedy has some depth to work with in trying to return the Rebels to the NCAA Tournament. Jarvis Summers will be one of the most heavily relied on players in the SEC this season (bigstory.ap.com). Weaknesses. Ole Miss may be deep but the Rebels will need to prove that they can score. Summers is an excellent player but there’s no doubt that he benefited from the focus that opposing defense paid to Henderson manically running around screens. Other than Summers, there are few proven scoring options on the team. White has some experience but is a career 38.9 percent shooter. None of the returning Ole Miss big men scored more than 7.1 points per game last season, although Perez and Saiz showed glimpses of potential. It may be that Kennedy is counting on his newcomers with Division I experience to carry a big portion of the scoring load. Smith (14.6 points per game at Tennessee-Martin) and M.J. Rhett (10.9 points per game at Tennessee State) averaged double figure scoring last season, but those numbers came in the Ohio Valley Conference. Moody scored 15.7 points per game at Florida Atlantic en route to the 2012-13 Sun Belt Freshman of the Year award before off-court issues led him to junior college. There are several glimmers of potential on this roster for Kennedy, but it’s never comforting to rely on players who have yet to suit up for the program.